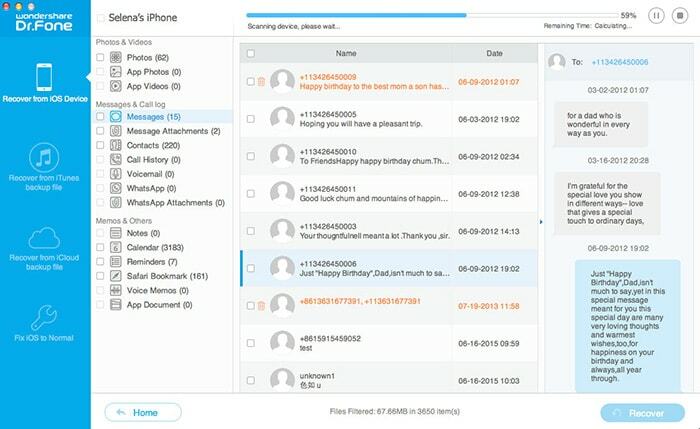 Can I Retrieve iPhone Contact List from My iPhone 4? I got a message from a random person and I wanted to delete it. So I swiped my finger across the first entry in my Messages folder and hit delete. Then I realized that I deleted the wrong one. I had deleted the entry for one of my friends who I've been texting for years now. I don't know how to get all our messages back. Is there any possible way? Don’t despair. This does not mean that your contacts are gone for good. The accidental deletion of contacts only means the contacts are inaccessible, as long as they have not been overwritten by new data. So, just put your iPhone 4 into flight mode and take Wondershare Dr.Fone (Mac) as a try. This Mac iPhone contacts recovery tool empowers you to recover contacts directly from iPhone 4/3GS, iPad 1 and iPod touch 4G, or from iTunes back up for all iOS device if you have iTunes backup on your Mac. 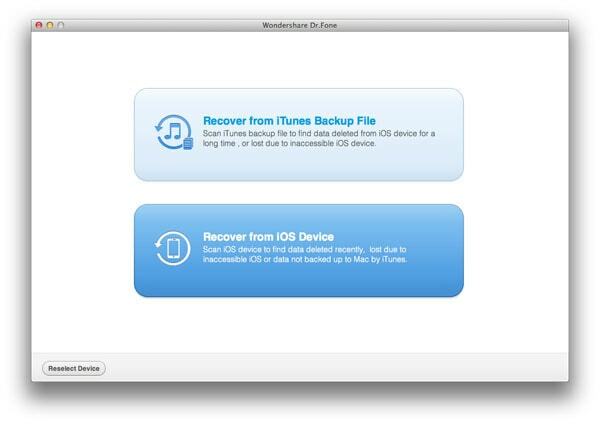 Download trial version of Wondershare Dr.Fone (Mac) and start your iPhone contacts recovery in Mac now. Step 1. 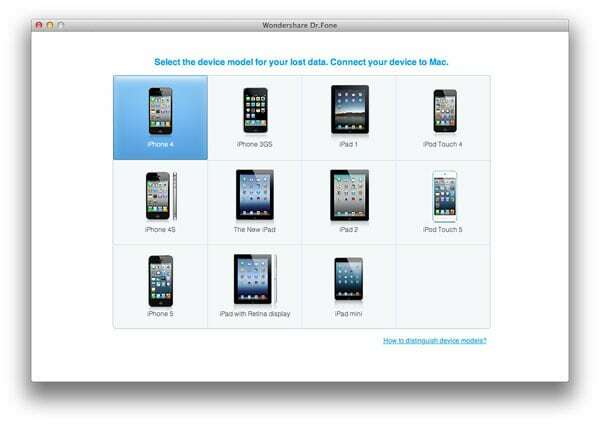 Run Wondershare Dr.Fone (Mac) and connect your iPhone with your Mac, you’ll be required to select your device model for scanning first. Step 2. Then you’ll get a window as below, which lists two recovery modes. 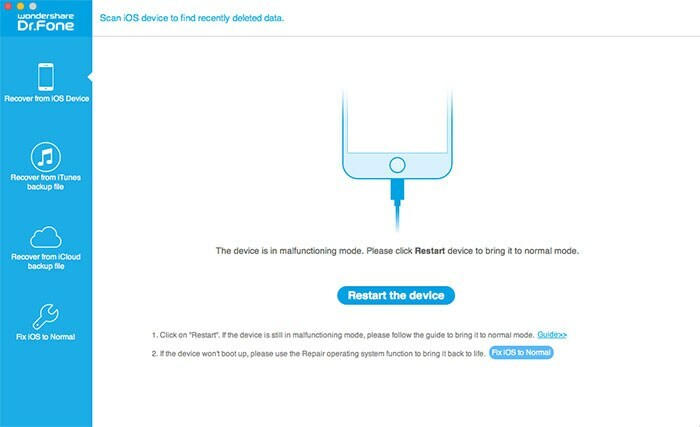 In this part, let’s try “Recover from iOS Device” mode. Note: You need to download a plug-in if you firstly use Dr.Fone (Mac) to scan your iPhone 3GS/4. Step 3. 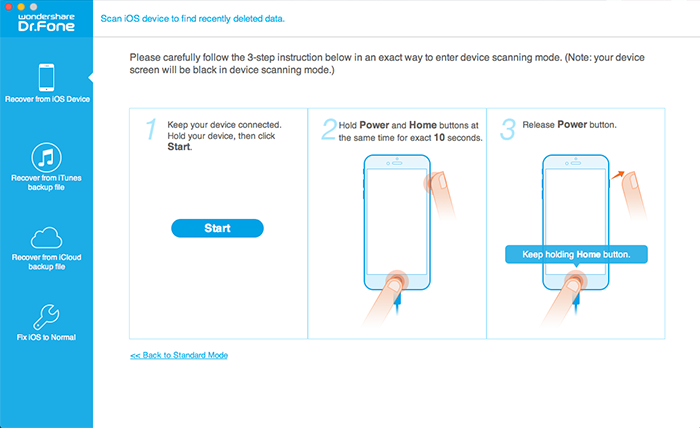 Then you are going to enter device system so that Dr.Fone (Mac) is able to scan your device directly. Please follow the instruction precisely to enter your device system. When successfully entering your device system, the program will be displayed as below. Click “Start Scan” to scan your iPhone 4/3GS now. The scanning process will be displayed as the image below. Step 4. 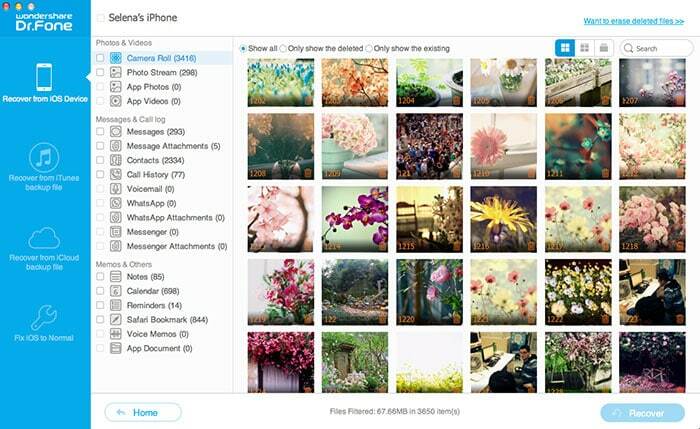 All found contents will be showed in categories like “Contacts”, “Messages”, “Notes”, “Photo Library” and more. To restore iPhone contacts in Mac, you can select “Contacts” to view details of the found contacts. In the end, you can mark your wanted contacts and save them on your Mac by click “Recover”. Note: The recovered contacts will be saved in .html, .csv and .vcf file types. You can add the recovered contacts to Mac address and then input them back to your iPhone. Before selecting this mode, please ensure that you have iTunes backup for your device on your Mac have not synced your device with iTunes since the contacts were lost. Step 1. After selecting your iPhone mode, you’ll need to select “Recover from iTunes Backup” mode. Step 2. Then the program will display iTunes backup files for all iOS devices that have been synced with your Mac. Select the one for your iPhone and click “Start Scan”. Step 3. 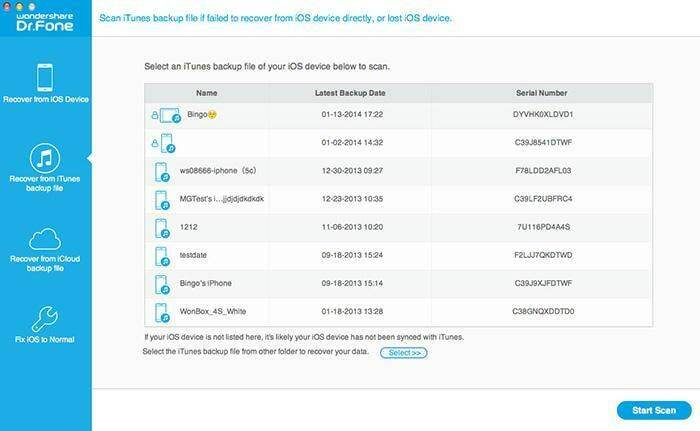 After the scan, all files in your iTunes backup will all be displayed. Here you can select “Contacts” to view how many recoverable contacts have been found. Then tick on those you are going to retrieve and click “Recover” to save them on your Mac. Note: Apart from iPhone contacts recovery Mac, you’ll be able to recover up to 12 file types on your Mac, including photos, videos, SMS, message attachments, calendars, notes and more. 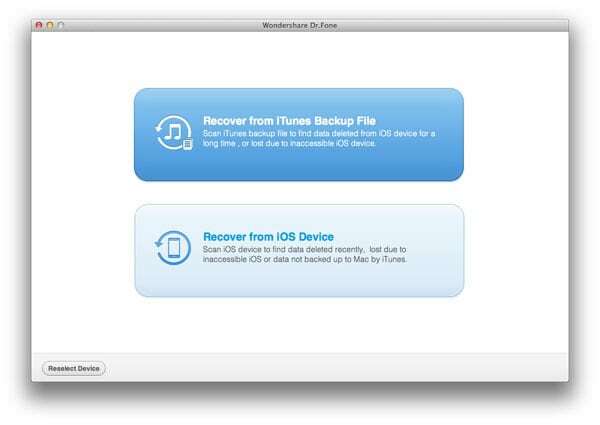 Ps: If you are a Windows user, you can now recover contacts directly from iPhone 5/4S/4/3GS with Windows version of Wondershare Dr.Fone now.